From the founding of the Roman empire to its fall in A.D. 476, Rome dominated Europe and much of North Africa, the Near East, and Asia Minor*. Although this sprawling empire encompassed many cultures with their own myths and legends, the mythology of the Romans themselves revolved around the founding, history, and heroes of the city of Rome. The Romans had developed their own pantheon of gods and goddesses. After they conquered Greece, however, their deities became increasingly associated with the figures of Greek mythology. Background and Sources. Although Rome's early history is difficult to separate from the legends that formed around it, the city appears to have begun as a community of central Italian peoples known as Latins. The Latins merged with the Etruscans, who had come to Italy from Asia Minor before 800 B.C. Until 510 B.C. , Rome was ruled by kings. Then it became a republic governed by elected officials. The Roman republic eventually dominated most of Italy and conquered the North African coast and Greece. By 31 B.C. , Rome governed all the lands around the Mediterranean Sea as well as northwest Europe. The principal sources of information about Roman mythology appeared during the early years of the empire, between about 20 B.C. and A.D. 20. 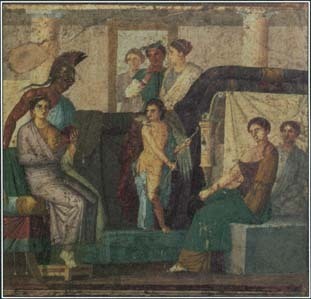 The poet Virgil produced Rome's national epic, the Aeneid, which drew on myths that linked the city's founding with Greek deities and legends. Another poet, Ovid, wrote the Metamorphoses, a collection of Near Eastern and Greek myths that the Romans had adopted. Ovid's Fasti describes Roman myths about the gods according to the festivals in their calendar. In his history of Rome, Livy portrayed legends about the city's founding as though they were historical events. These and other writers worked to create an "official" Roman mythology, one that gave Rome an ancient, distinguished, and glorious heritage. Major Deities. In their early years, Roman people had many gods and goddesses called numina, or powers. Unlike the Greek deities, the numina did not have distinctive, well-defined personalities and characteristics. Few stories about them existed. They were simply the forces that oversaw the activities of daily life. Examples include Janus, god of doorways and archways, and Terminus, god of boundaries. Many early Roman deities were patrons of farming, crops, or the land. Sylvanus, for example, was the protector of woodcutters and plowmen. Other early deities represented virtues or qualities, such as Concordia (goddess of agreement), Fides (goddess of honesty), and Fortuna (goddess of fate or luck). Captivated by the elaborate and entertaining myths the Greeks had woven around their gods and goddesses, the Romans gradually changed some of their numina into Roman versions of the major Greek deities. The ancient Roman god Saturn, guardian of seeds and planting, became identified with the Titan* Cronus, who appeared in Greek mythology as the ancestor of the gods. Aphrodite became Venus, the Roman goddess of love. Zeus and Hera, the king and queen of the Greek gods, became the Roman Jupiter (sometimes called Jove) and Juno. This fresco from the ancient Roman city of Pompeii shows the courtship of Mars and Venus. Mars, the Roman god of agriculture and war, was identified with Ares, the Greek god of war. Venus, the Roman goddess of love and beauty, was linked to the Greek goddess Aphrodite. of Hephaestus*, Mercury of Hermes*, Ceres of Demeter*, and Bacchus of Dionysus*. Apollo*, too, was brought into the Roman pantheon, where he was known as both Apollo and Phoebus. The Romans gave their deities some of the characteristics and even some of the stories associated with the Greek gods and goddesses. They also imported other foreign deities, such as Cybele from near Troy in Asia Minor and the Persian god Mithras. At the same time, in their own homes they continued to worship their traditional household gods, known as the Lares and Penates. Roman mythology also includes human heroes. Sometimes these mortals became deities. Romulus, the legendary founder of the city of Rome, was thought to have become the god Quirinus. Many emperors were declared gods by the Roman senate after their deaths, and people worshiped them in temples. The most honored heroes, however, were Aeneas, Romulus and Remus, and others from myths about Rome's beginnings and early history. Major Myths and Themes. Romans cherished myths about their city's founding. A myth that probably dates from around 400 B.C. told of the twins Romulus and Remus, offspring of a Latin princess and the god Mars. Although their uncle tried to drown them, they survived under the care of a she-wolf and a woodpecker. Eventually, the twins overthrew their uncle and decided to found a new city on the spot where they had been rescued by the she-wolf. After receiving an omen from the gods about the new city, Romulus killed Remus and became leader—as the gods had intended. Rome took its name from him. The ditch that Romulus dug to mark the boundary of Rome was called the pomerium. Everything within the pomerium was considered to be part of the original, authentic, sacred Rome. Throughout Rome's long history, the Romans preserved landmarks within the pomerium that they associated with the legend of Romulus and Remus. These included a cave on the Palatine Hill where the wolf was said to have nursed the twins and a nearby hut where Romulus was said to have lived. According to legend, Romulus made the new city a refuge for criminals, poor people, and runaway slaves to attract citizens. Because this population lacked women, Romulus invited a neighboring people called the Sabines to a religious festival and then kidnapped the Sabine women. Titus Tatius, king of the Sabines, brought an army to wage war on Rome. By that time, however, the Sabine women had married Romans. At their urging, the men made peace, and until his death, Titus ruled at the side of Romulus. One of Rome's most worshiped goddesses received little literary attention. According to legend, Angerona knew a magical spell to raise the sun in midwinter. Her festival occurred on December 21, the shortest day of the year, when she was believed to say the words that would cause the days to lengthen and spring to return. Even more important, Angerona guarded the secret name of the city of Rome. The gods knew this name, but Rome would be doomed if people ever learned it. Statues of Angerona showed her mouth covered with her hands or a gag so that the secret name could not slip out. A famous Roman myth tells of the she-wolf that cared for Romulus and Remus in a cave. 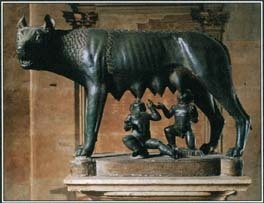 Romulus later killed Remus and founded the city of Rome on the spot where they had met the she-wolf. brave soldier Horatius, both of whom appear in tales about the downfall of the monarchy and the founding of the republic. By the late years of the republic, Romans had adopted a powerful new myth about their state's origins. This account is most fully told in the Aeneid. It revolves around Aeneas, a Trojan* prince who fled from his ruined homeland because the gods told him that he was fated to establish a "new Troy" After wandering around the Mediterranean, Aeneas landed in Italy with some Trojan followers. There he married the daughter of the local Latin king; Aeneas's son Ascanius founded a settlement called Alba Longa. This version of Roman history emphasized the idea that the gods had always meant for Rome to rule the world. Romulus and Remus became sons of a princess of Alba Longa, descendants of Aeneas—a perfect example of Roman willingness and ability to piece together different myths. Myths arose linking many deities with key events in Roman history. The twin wind gods Castor and Pollux, together called the Dioscuri, appear in both Greek and Roman mythology as inseparable brothers who form the constellation Gemini. In the Roman version, the Dioscuri fought on the side of the Roman army in a battle in the 490s B.C. , and they brought word of the Roman victory back to the city. The myths and legends about Roman history celebrate the virtues that Romans especially prized: duty, self-sacrifice, honor, bravery, and piety. Roman deities, too, tended to represent virtues, without the all-too-human weaknesses and vices of the Greek gods. A Greek historian named Dionysius of Halicarnassus recognized this difference when he wrote that the Roman deities were more moral than the Greek deities because the Romans had taken only what was good from the old stories and left out all the disgraceful parts. Legacy. The influence of Roman mythology extended farther and lasted longer than the Roman empire. Statues, temples, and other structures associated with Roman gods and myths can be found far from the ancient capital. An old mosaic in Britain, for example, shows the she-wolf feeding Romulus and Remus. It is a reminder of the days when Rome ruled Britain and a mark of how far Roman mythology spread. inspiration in the Aeneid and in Rome's heavily mythologized version of its history. See also Aeneas ; Aeneid, The ; Apollo ; Castor and Pollux ; Cybele ; Diana ; Greek Mythology ; Horatius ; Janus ; Lares and Penates ; Lucretia ; Metamorphoses, The ; Mithras ; Neptune ; Ovid ; Romulus and Remus ; Saturn ; Trojan War ; Venus ; Vesta .